Is it possible to lead a very elegant life if you have young children? Without employing a nanny, I mean. But it certainly depends on how you view your relationship with your children, your spouse and your environment. Let me explain. I recently left a comment on a nice little blog suggesting that the new owner of a vintage tartan sportcoat have some grosgrain lapels run up to convert it to a dinner jacket as needed. While he appreciated the idea, he replied that as the father of two small children he didn’t foresee the likelihood of attending a formal event, even at home. I hope that his situation doesn’t disappoint him. It would me. Taking the kids to something and letting them run around and play, tossing a ball, blowing bubbles, riding the tricycles are all lots of fun, but Mrs. E. and I need our time — and I like to dress. As I’ve no doubt mentioned before, I grew up amidst a cocktail party. Perhaps the reason that the opening scenes of Rosalind Russell’s cocktail party in “Auntie Mame” resonate so well with me is that it seems a bit like what I remember from childhood. Oh, we didn’t inhabit 1 Beekman Place, or its close equivalent. The earliest of these memories of my parents must have its roots in about 1971 or ’72. Ours was a three floor townhouse in a small town in the south of Holland. My father was attached to NATO at the time, working at an Army post and making trips to SHAPE when called upon. My father was the only American officer in an office of Belgians, Brits, Dutch, I’m not sure who all… . It goes without saying that my parents’ parties were not filled with Bohemian artists, tycoons, philosophers, and actors. But they did have their fair share of foreign military personnel and ex-pats. Somewhere there is a picture of my five year old self making the rounds with a bar towel draped over an arm and a martini laden tray in hand. In fact, I looked a lot like that kid on the dust jacket above; only my suit was black velvet (it was usually after six…) Sometimes I would help empty those silver rimmed crystal ashtrays (remember those?) of the Dunhills, Player’s and lipstick-smudged Sobranies. You know those jazz recordings where you hear the audience dining in the background? That low mummur under the music, the ice clinking in the glasses, the occasional peel of laughter? I’m right back there, five years old. I longed to be a grown-up. They were having some kind of a good time! I guess my point is that I fit into my parents’ life, they didn’t fit into mine. When I stepped out of the house, I was reminded that I was representing my County and my parents, in that order. By all accounts, I was well-behaved. I’m an only and I’m sure that this is much easier a) on foreign soil and b) with a somewhat sickly little kid who didn’t always have a lot of wind, but was pretty well medicated and c) if you outnumber your charges. Now that I have two children under the age of five (and as an older parent of almost 43), I marvel at how well my parents’ generation maintained control. I don’t remember feeling particularly put upon, or stifled. There was a pecking order and I was at the bottom of it. Acknowledged, listened to, encouraged and accommodated — to a point. What’s the point? you’re asking. Just this. Give your kids some great memories of adults in action. Throw a cocktail party and make it as formal as you’d like. With our weather lately, chances are the ballgame’s going to be rained out anyway. Have the gang over. The bonus? You don’t have to pay a sitter, you’re at home. But make it a cocktail party. What the French do when they invite you for an aperitif. Set it for 7:30 – 9 PM or 5 – 7 PM, depending on how involved you want the children to be. But set the time for the party to end. That means a limited number of finger foods/snacks/hors d’œuvres, and drinks. Nothing too fancy and certainly nothing like a Blue Blazer that requires open flame. Make and pass: Broiled rounds of French bread covered with swiss cheese and sprinkled with bits of ham and a dab of mustard and Triscuts with cream cheese and pepper jelly. Scatter about salted mixed nuts and potato chips. As for the bar, have on hand lots of good ice, several bottles of sparkling wine/Champagne/Cava, a bottle or two of red, a bottle of Scotch whisky, a bottle of Bourbon (especially if you’re here in the South! ), a bottle of gin (and a small bottle of chilled Vermouth), a bottle of Vodka and a bottle of Rum. Mixers should include Coca Cola (I like to serve Coke Zero, diet but tastes like the real thing), Ginger Ale, Tonic, Soda and a fruit juice if you’re feeling up to it. Slice up some citrus fruits for the bar and lay out a bowl of olives and a shot glass of cocktail picks. One pitcher (or Boston Shaker and strainer) and stirrer and one cocktail shaker should serve you well. Stemmed glasses for the wines, double-old-fashioneds for the mixed drinks and a couple of martini glasses are usually all the glasses you need. There are a few of good books that I recommend for new parents. If you’re still hankering for an outdoor adventure, have everyone bring the kids and set up the lawn games (croquet, bocce/pétanque, bicycle polo, badminton.) I usually wait until after Memorial Day to do this as I can wear a white dinner jacket in the evening or white linen trousers during the day. The dry cleaning bills are worth it, and you’re teaching the children that you can be well-dressed and still have fun. 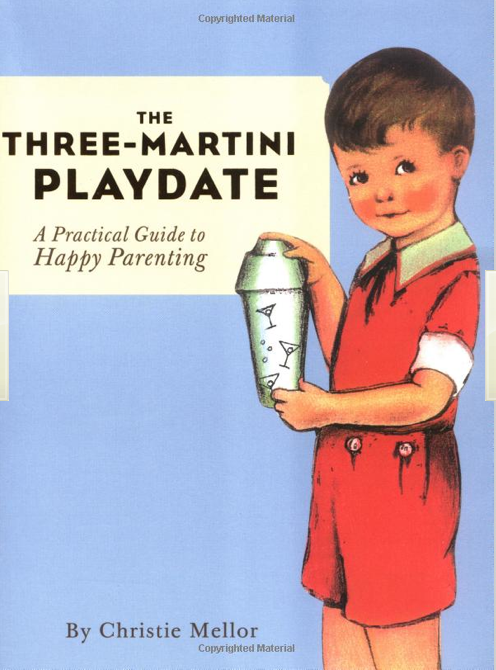 This entry was posted in Entertaining, Living and tagged Happy Baby, Healthy Sleep Habits, How to Raise a Gentleman, raising children, The Three Martini Playdate. Bookmark the permalink. This post brought back so many happy memories. My parents entertained frequently when we were growing up, my father being an officer in the USAF, and gave my sister and me ( years 8 and 10) the tasks of carrying small trays of drinks, collecting empties, etc. As the evening drew to a close, my sister and I would entertain the guests with one or two musical duets (my father directed our practice sessions!) from Broadway musicals. Daddy did this for two reasons: to amuse his guests; but more importantly, to teach my sister and me how to think and perform in front of people, under pressure, without being nervous or self conscious. To this day, speaking in public doesn’t faze me in the least. So sorry about your daughter. Hope she’s on the mend. I remember fondly, the numerous cocktail and dinner parties my parents had. They traveled extensively and when they came back from trips, they had huge parties featuring the cuisine of the country where they’d been. They expected us to meet their friends, shaking hands and making a little bit of conversation. Your line of fitting into their life rather than the reverse is the way it should be. I see my siblings attending basketball, lacrosse and squash practices for their children on Friday and Saturday nights, when they should be socializing with their friends. I’d love to hear your thoughts on Free Range children, although yours are a little young for that! However, I’m very happy to say that now my oldest son (just out of college) can mix a nice dry martini and he’s particularly skilled at absinthe preparation. 😉 It’s a pleasure to sit with him, enjoy a cocktail and adult conversation! So sorry about your patient. My youngest had pneumonia last year and it was horrid. I does take them a while to get back to 100%. Although we have no children at present, I do whole-heartedly agree with your post and hope to one day raise children that others enjoy being around. The main reason for this comment, however, is to let you know that your work has not been in vain. I’ve only been a reader of this site for a short time, but have enjoyed it immensely. In my new quest to live each day a bit more elegantly, I held an impromptu dinner party in my home last night for a few girlfriends (who were of course dressed for the occasion). We pulled out the fine crystal, linens and silver and had a lovely dinner on a beautifully set table. A wonderful time was had by all- and I thank you for inspiring it. I’ve always loved entertaining, but have typically reserved it for weekends. Now, every day is a cause for elegance. Firstly, i do hope your child is recovering speedily. It must have been an horrible experience for you and your wife to see your child be so sick. For me, too, your post brought back many happy and positive memories. my parents and my grandfather entertained a lot and how we loved putting on our ‘party clothes’ to hand around canapes and fetch fresh drinks. How we admired the grown-ups party clothes and how special we felt when we were addressed by one of the grown-ups and spoken to exactly as if we were a real grown-up ourselves! I can see now those experiences went a long way to imbuing manners, social skills and self-confidence. The other thing i remember is as very small children we weren’t reasoned with, asked to do doing things or begged to behave in a certain way, we were told. Politely, firmly, kindly told. We knew who were in charge and they were a lot taller than we were. Like you, we fitted into our parents lives and not the other way round. Hooorah Aimee! The first step in a very pleasant journey. Best wishes. Mrs. B., what fond memories they will be, too! CL, higher education was not wasted on your oldest. These are skills to carry the graduate far indeed. P-D, thanks! I’ll get back to you on Free Range Children… only properly cooked… . DD, we are birds of a feather. Mine were pop standards… Do You Know the Way to San José? etc… . Thank you for a great post on the subject of raising elegant children. When our children were very young, I passed on many of the organized kid activities because they cut into our home life in a too heavy handed way. For example, a swim team practiced over the dinner hour five days a week. And the Little League Baseball team scheduled games on Sunday mornings, Easter Sunday, Mother’s & Father’s Day. If you won, you got to go to the tournament over the Fourth of July weekend! It is difficult for parents because they are surrounded by a culture that revolves around the kids’ activities. To ensure kids have a lot of memories in their own backyard, at their own home, parents really have to take charge. It won’t happen naturally and there is a lot of peer pressure from very busy families. As a parent who has been through it, I encourage you to quit a lot of ridiculous overly-adult-supervised organized sports and take charge of your family life. Certainly some good lessons can be learned on the field, but it has really gotten out of hand. The best tip I can offer–stay home lots, sit on the back porch with a cool refreshment, read aloud with your child for as long as they will stay with it, take walks and bike rides, visit the relatives. This helps kids realize the entire world does not revolve around them and their self-improvement. I cannot over-emphasize the importance of reading. It was our bedtime ritual unless we were entertaining. Seek out vintage and out of print books and authors. Read the classics with them. And entertain at home, entertain well, and let the kids see what a lovely life their parents create and live. Great post, great reflections, great comments! thanks for the memories! i looked forward to my parents frequent cocktail parties when i was small too- everyone looking so glamorous in cocktail dresses and suit or dress uniforms. like you, my job was to empty ashtrays, and remove used glasses. i was always too scared to serve a tray of drinks, but i did love circling with an appetizer platter (probably ate more then i served, tho). i have similar childhood memories. the jazz music you referred to ? i was there, right with you as you described the sounds behind the music. my dad owned jazz night clubs when i was little ( 4- 8 yrs ), they used to bring me to the club when someone famous would be performing. …my childhood memories, and i’ve many, are so dreamy. and very. very, ‘ cool’. you are right on all points ! we need to expose our children to wonderful experiences. Please accept my best wishes for your daughter’s quick and thorough recovery. Wretched business, that sort of thing. As for kids at cocktail parties, I do fondly remember my parents’. When younger, my sisters and I would be allowed to watch television in my parents’ room. My mom would make us a little tray of party treats, set up a bar of soda and juice on her dresser and warn us not to come out unless someone was bleeding. Later, we’d don matching dresses (velvet in winter, eyelet in summer) and help serve and clean. We were taught how to say, “Hello, Mr. -. Would you like another Scotch?” or “How do you do, Dr. -. We so pleased you could join us.” I learned to pour a drink for a gentleman, walk in (low) heels on grass and generally be pleasant to large numbers of people at once. Good times. Now with two children of my own I’d love to strike the double pleasure of a party for myself and a learning experience for them. Convincing others in my set to play along is proving the primary challenge. It’s hard enough having a grown-ups only event (where mine would be the only children), but to give it the name of cocktails I fear no one would accept the invitation on the grounds that they don’t wish to dress. How on earth did I get in this situation? Maddening. Glad to know that your little one is on the mend. I remember being so excited when we were expecting LFG. I also delighted in knowing that we were having a girl. Her nursery was already decorated when she arrived. Little dresses appeared with smocking-needlepoint monograms….we had already named her long before we knew she was a “she”. I would talk to her in-utero and call her by name. Oh, the incredibly sublime memories of impending daddy hood. LFG was part of the adult crowd from the beginning. Maybe because we too, had her when we were a bit older. Maybe not. I will say though, that I believe our parents were a bit tougher-more resilient…not sure why. Alan Flusser has two grown daughters and I can remember him telling me that all of my clothes would henceforth be covered in baby formula etc for several years. No problem…I loved every minute of it. As for skipping the cocktail party here and there, we more than made up for it during LFG’s toddlerhood. Parties at home, with neighbors with kids. It’s all good. Thank you one and all. What wonderful stories you have of your own childhood days and I am pleased to hear that you are making such good memories for your children. As Paula points out, it is a bit more work, but that’s what we’re here for — to take charge. Renee, I’m jealous. Jazz clubs! Bet you heard (and saw!) some great performances. I think that it is possible to be elegant while raising children without a nanny, but the children would have to be reared in a certain manner. As an educator, I see that many children nowadays are overindulged and spoiled. For a child at a very adult function to be acceptable, the child has to be extremely well behaved, charming, and polite to a fault. A spoiled, whiney, obnoxious child will severely dampen a festive mood. Children also have to be trained to speak audibly and face the listener, good experience for later that many parents and teachers overlook. In this day and age, it is rare to see children beautifully dressed in polished shoes, a necktie, or a dress. That in itself is a treat for many adults. As for elegant cocktail or dinner party entertaining without help, the correct, carefully chosen equipment is imperative. While the 1960s Rat Pack bar is a now passé monument to self indulgence, a portable tea wagon, preferably metal in something chic like Deco chrome, or metal faux bamboo, when stocked with the items you’ve mentioned, is almost as good as having a bartender. It just needs to be close and convenient. Also, plenty of inexpensive, sturdy, hotel style, footed, multi-purpose glasses. Delicate glasses on overly long stems are both impractical and pretentious. Nobody cares if the glass is Baccarat, but they do care if the ice cubes are made with chlorinated water (yuck!). Silver plated (plainer the better) serving trays are great too. Great quality ones can be had at flea markets and garage sales for under $20.00, and they always look very impressive, elegant, and they add a note of distinction and quality. It is important that children be taken to more formal events such as theatre or symphony performances and at least an occasional religious service. We live in very casual times, and so many people have never had the chance to understand the different types of deportment, dress, and behaviour for different social functions. I think if children get dressed up once in a while, they will be better prepared for their first job interview when they are teenagers, and they will have a much wider choice of experiences and opportunities in their future. In this respect, Auntie Mame was so right in her attitudes to rearing the young and impressionable. Raising an educated, culturally aware youngster need not be expensive. Superb cultural experiences are seconds away on the Internet. Last week I had a room full of youngsters enthralled as they watched Disney’s animated version of Prokofiev’s “Peter and the Wolf” on YouTube. And of course the underused Public Library is a treasure trove. Wonderful jazz and classical music can always be the background of our lives with free radio or the excellent “streamed” Internet radio stations (these are great for the cocktail party too!). In fact, why not listen to the stations that are in French or Spanish, and they can be learning another language at the same time?! For those who want to entertain elegantly, and care passionately about this subject, I cannot think of a better book than “Entertaining with Elegance,” 1965, by Geneviève Antoine-Dariaux. Sincere, intelligent, refined, entertaining, and practical, it is as relevant as when written 40+ years ago. Elegant entertaining without help, but with children? Yes, but there are a few limitations, and it takes planning, taste, a bit of flair, and a sense of what is appropriate. I am certain that the writer is able to do it most successfully. Thank you for the super article. I am sure that it will inspire others. I am sorry to hear that my bar room is passé, but my friends don’t seem to notice or are kind enough not to mention it; we are a self-indulgent crowd. I do have drinks trays or carts in every room though — close and convenient are operative terms here at the manse. I think I’ll try “Peter and the Wolf” through YouTube on the children today! Somehow it didn’t occur to me to check YouTube. I wonder if Leonard Bernstein’s children’s programs are available? Off to find a copy of the book as I’ve read her “Elegance” and found it useful. Happy weekend. Looking forward to more comments! I’m always the last to arrive at the party. I’ve been remiss. Perhaps I should begin carting my own bar tray as I go. Wonderful post. I so heartily applaud and endorse the sensibility of including children in the adult’s playtime activities and wonder, somewhat wistfully, where and how it all changed. It would seem the balance of leisure time power has shifted dramatically from late day cocktail parties to a summer evening’s gathering in the outfield. the nostalgia and reveries were wonderful. We take our daughter (age 7) to formal events when possible and appropriate. Luckily she is at an age when dressing up has become enormous fun (scent, earrings, flouncy dress, shiny shoes, bow in the hair) and though she claims to be shy, she has become a bit more relaxed and comfortable with small talk. Oddly enough I think good training is to conduct mock parties at home, ie one-on-one tea parties, et cetera, where adult and child chat away, hopefully replicating (more or less) typical social discourse. AL, that is (as usual) an excellent suggestion. The teaparty as a primer! I’ll start at once. Thank you.